Pamplona – Viva San Fermín! BoardGaming.com> Games> Board Games> Pamplona – Viva San Fermín! A racing game where you walk the fine line between bravery and foolishness! Pamplona – Viva San Fermín! lets you experience the famous running of the bulls at the Fiesta de San Fermín in Spain. Luckily the only things getting trampled are game tokens and egos. What makes Pamplona unique among racing games is each player controls three things on the track: a runner, bull and ox. The game also isn’t about who crosses the finish line first. It’s about being the runner who survives the race, while having your bull and ox successfully chase down other runners! The production value is very high with this game. The bulls are plastic miniatures (you can even change the position of the horns!). The runners are cardboard tokens. The reason they aren’t miniatures is because they will be trampled by bulls or oxen, and being a flat token allows you to easily place the bull or ox on top of the poor runner. There are four sections to the race, and your runner will get a chance to run each section, even if they were taken out during a previous section. At the start of each section, players will take turns placing their ox, then bull, then runners. The points a runner can earn in a section is determined by how close you place them to the lead bull. To play it safe, you can place your runner 4 spaces ahead, and come out with 2 points. To earn the most points, put your runner directly in front of the lead bull, and TRY to survive that section of the race! This all makes for fun variety in gameplay. Being safe pretty much guarantees you’ll get a couple points each round. Being risky means you can score big, but you may come out with nothing. To mix things up some more, each player will get a special card at the start of each section. These cards can only be used once that section. They do things like allow you to trip another runner, or dodge an incoming trample. Each player will also get a blessing card and two beer cards (or cream soda cards, as we would call them when playing with kids), that you can use once per game. 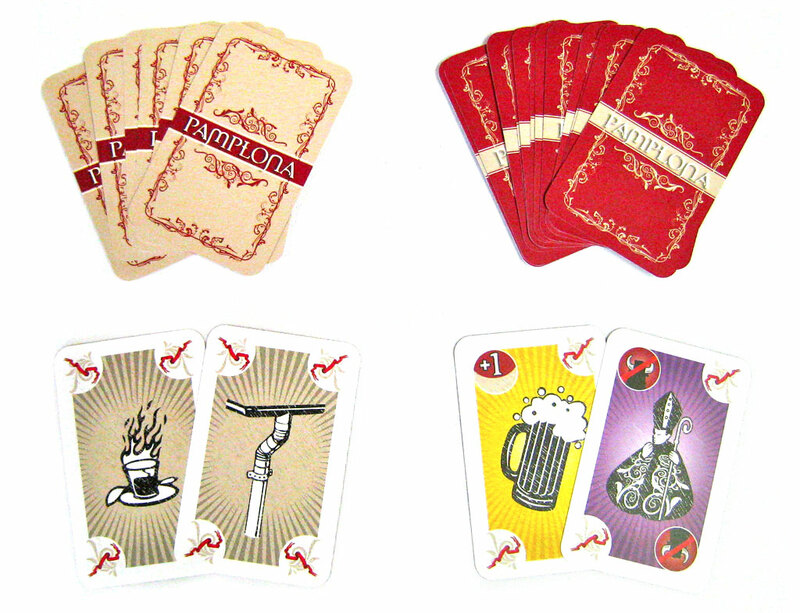 The beer cards give your runner a boost in movement, and the blessing card saves your runner from being gored. 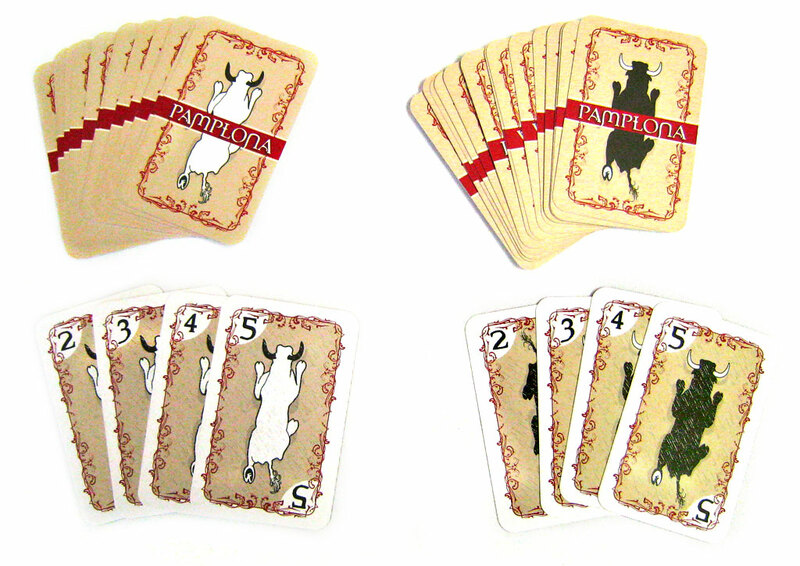 Movement of the oxen and bulls is controlled by cards you draw at the beginning of each section. These cards make ox and bull movement hard to predict, adding to the danger and risk. I would compare the thought process of moving the runners, bulls and oxen to a game of chess. The runner could roughly be compared to a pawn, the bull a knight, and the ox a rook. You will base your movements on the turn order, what will protect your runner, and what will set you up the next turn for possibly taking out other runners. The runners, bulls and oxen can only move forward or diagonally forward. The bulls and oxen move much faster than the runners so it is common for them to move ahead of the runners. Having your runner behind the herd is the safest place to be! The game is very different when playing with two players, compared to playing with three or four players. Two players means you’ll only have one bull and ox that might take your runner out. Four players means there are three bulls and three oxen to worry about! The beauty is that the game is broken into four sections. If your risky strategy didn’t pay off during one section, you can always change it up and be more cautious during the next section. Who would like this game? Families will enjoy the simple rules and theme that is fun to experience. The high production value, especially with the bulls and oxen, does a great job at giving that sense of running with the bulls! There is a certain amount of luck and unpredictability involved in what movement cards are drawn for the bulls and oxen, but this shouldn’t turn away strategy gamers. There is plenty of movement strategy where you make your moves based on what others might do, or what you could possibly influence them to do. Casual players should find this game easy to get into, and it has enough depth in the strategy to provide avid gamers with a decent level of replay value. If you’ve never played a racing board game, this is a fun place to start. The rules are simple and the theme is unique. The movement cards and special cards mean you can never bee 100% certain what to expect from your opponent. For me that equals higher replay value. This is definitely a game that won’t collect dust on my shelf. Pamplona attracts over 1 million visitors each year in July for its nine-day San Fermín festival, which originated in the 14th century. The daily Running of the Bulls, so dear to Hemingway, is its highest profile event. With its simple yet refined mechanics, Pamplona – Viva San Fermín! Faithfully reproduces the run in all its aspects: bravery, euphoria, adrenaline, but also tactics and management. 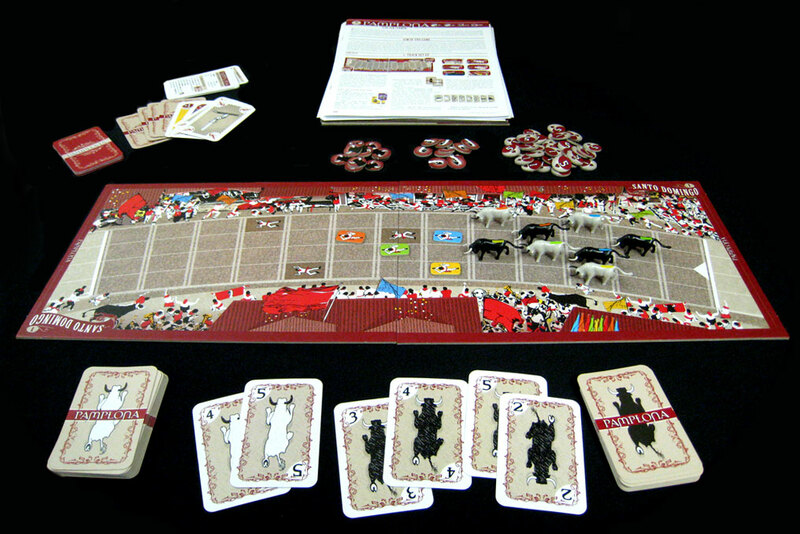 Players must run all of the 4 sectors of the race, escaping from the opponents’ bulls and steers, while trying to gore or trample the opponents using their own. Pamplona – Viva San Fermín! is not a common race. The winner is not necessarily the first runner to cross the finish line, but the one who shows the most courage. A fun game, fast paced and humorous. You control a bull, and ox, and a runner. You’ve got to get your runner through the race… but you also get to gore and trample your opponents with your bull and your ox. Nothing’s more funny than catching up with your fleeing enemies and goring them off the map. It’s always good for a laugh. Disclosure – I work for a game distributor that carries this game. Great for those gamers looking for something quick and simple to pick up, even when there are non-gamers around! I have played with my girlfriend and she is very much a ‘non-gamer’ and she enjoyed it enough to play a couple more games which says a lot in my books. Add a Review for "Pamplona – Viva San Fermín!"  Pamplona – Viva San Fermín!